The journey in what has been dubbed the world’s slowest express train takes travellers across the Alps within roughly eight hours, passing through 91 tunnels and over 291 bridges. With its oversized panoramic windows, the Glacier Express opens up unobstructed views of unique landscapes. The Excellence is the new premium class of the Glacier Express. It impresses with its high-quality full service offer and its modern design. Guests are being treated to a truly exceptional journey across the Swiss Alps while marvelling at the fantastic panorama. Thanks to comfortable lounge seating, each traveller enjoys a window seat. Excellence Class offers personal travel guidance, a trendy bar area, a premium multi-course lunch and many more amenities – all included. As of 02. 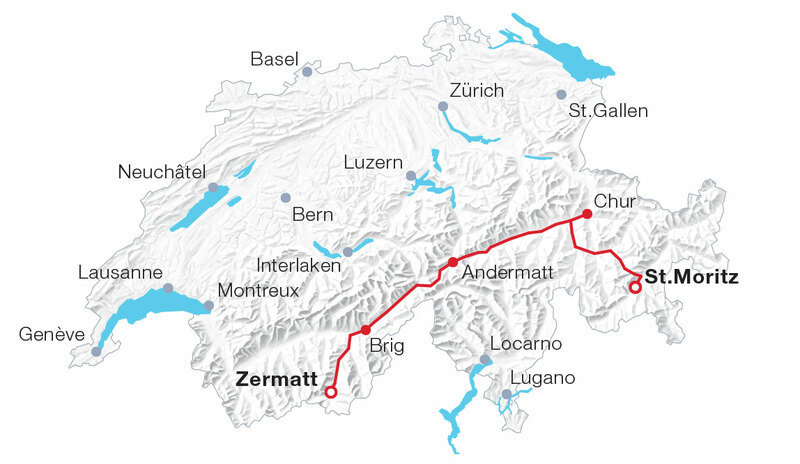 March 2019 the Excellence Class runs between St. Moritz and Zermatt.